​The Pennyrile Area Agency on Aging and Independent Living is the first and only AAAIL in Kentucky to become an approved provider through the Veteran’s Administration Readiness Review process. The Pennyrile is a provider of Veteran’s Directed Home and Community Based Services. These services are designed to enhance home-based services for veterans. The program offers eligible veterans a flexible budget to purchase services to assist them to live independently at home in the community. Program services include a functional assessment, home-based services, options counseling, support services, and financial management. The program offers service to veteran’s in the Pennyrile, Green River and Purchase districts. The program is made possible in part, through an agreement with the Marion, Illinois Veterans Administration Medical Center. NADO is a Washington, DC-based association that promotes programs and policies that strengthen local governments, communities, and economies through regional cooperation, program delivery, and comprehensive strategies. The association’s Innovation Awards program recognizes regional development organizations and partnering organizations for improving the economic and community competitiveness of our nation’s regions and local communities. 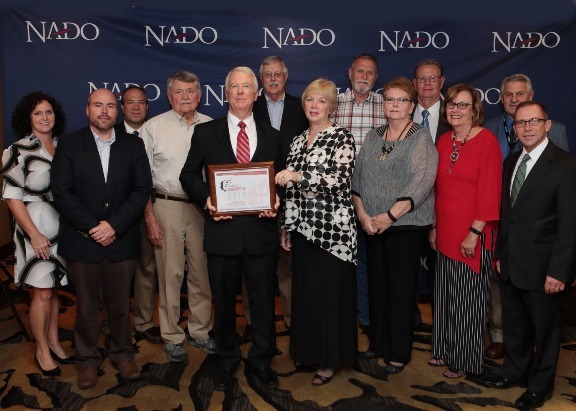 Award-winning projects were honored during NADO’s 2016 Annual Training Conference, held October 15-18 in San Antonio, TX. The 2016 class of award recipients consists of 96 projects spanning 28 states. These projects are presented in an interactive “Story Map” developed by NADO and Esri and include project summaries, funding information, and partners. The Story Map is available online at: https://www.nado.org/innovationawards/.